This is a perfect make-ahead dessert that will impress your family and guests. Chewy, crunchy, healthy, and just plain yummy! And it only takes a few minutes to make it up! * Coat an 8 x 8 pan with a light mist of pan spray. 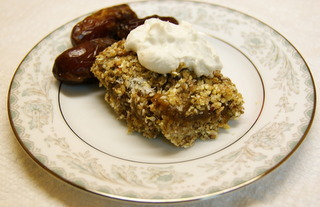 * In a food processor, process the nuts, salt, and oats and/or buckwheat until a crumble forms. * Add in the dates and process until crumbly again. Melt the coconut oil and add to the mixture and process until it will stick together when squeezed. * Remove from processor, set aside 3/4 cup of the mixture for later. Press the rest of the mixture very firmly and evenly into the pan. * Next blend the dates and water in the blender until a paste forms. Scoop out the date mixture onto the crust and gently spread with the back of a wet spatula until even. * Sprinkle on the 3/4 cup of mixture you set aside and gently press down with fingers. Top with flaked coconut. * Refrigerate in the fridge until firm for at least 1 hour, but best to leave overnight. Cut into 25 squares and serve. * Store in the refrigerator.